Hello everyone!!! Its Top Dog Die Wednesday!! I’m here showcasing Top Dog Dies Hot Air Balloon Die Set!! I love this set. Its so cute when you die cut the balloons and clouds out!! The detail stitch lines give off a great finishing touch. I love how this card turned out. I used one of those watercolor pieces that I create last week. Having these ready to go makes it so much easier to get cards done at the last minute. I used one sheet and cut a bunch of balloons out. So to use now and some to use later. Creating this card was super simple. All I did was die cut the balloons out of the watercolor panel and cut the balloon basket out of black cardstock. I adhered the pieces the way I wanted with liquid glue and foam adhesive to the card base. I used Mama Elephant Up and Away Stamp Set to stamp my sentiment under the balloons. I used We R Memory Keepers Corner Chomper to round the bottom right corner of the card. So what do you think? Let me know below! I’m sending this card over sees to a great friend of mines. I hope she likes it. Oh WOW!! I LOVE how you used that watercolor paper you made on these balloons. This card is FABULOUS!! 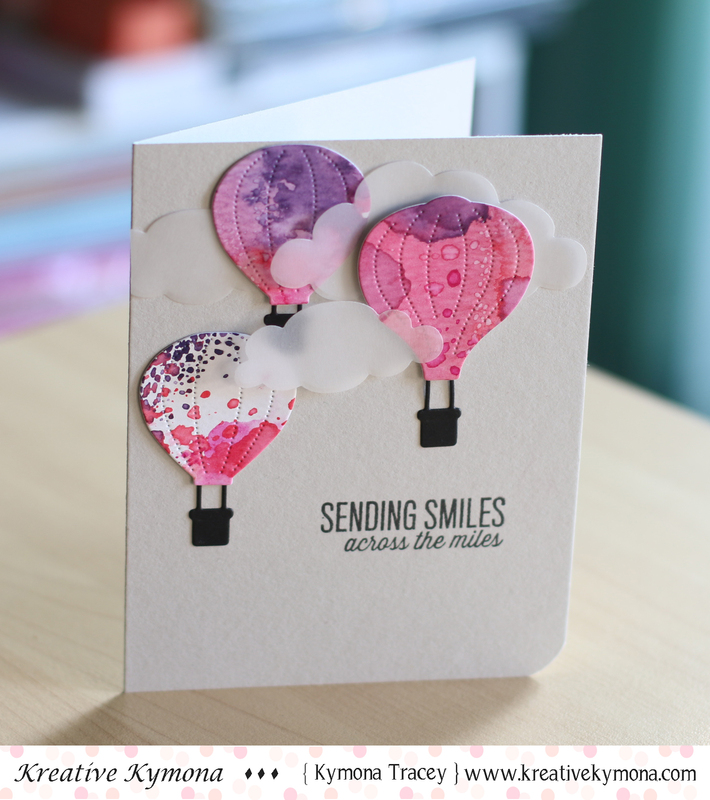 What luscious and lovely balloons you have created – they are adding so much sparkle to your sky!! Wonderfully done and super impressive – LOVE this card! !